A theory has it that if a child has thin hair, only way to get it thick is to shave it off once. We agreed and thought of doing it to our daughter long ago. Last winter, my wife said it's too cold to have her shaved, and when summer came she said it's hot and our babe can't wear cap. Thus, we kept pushing away the idea, because deep inside both of us didn't want to do it. 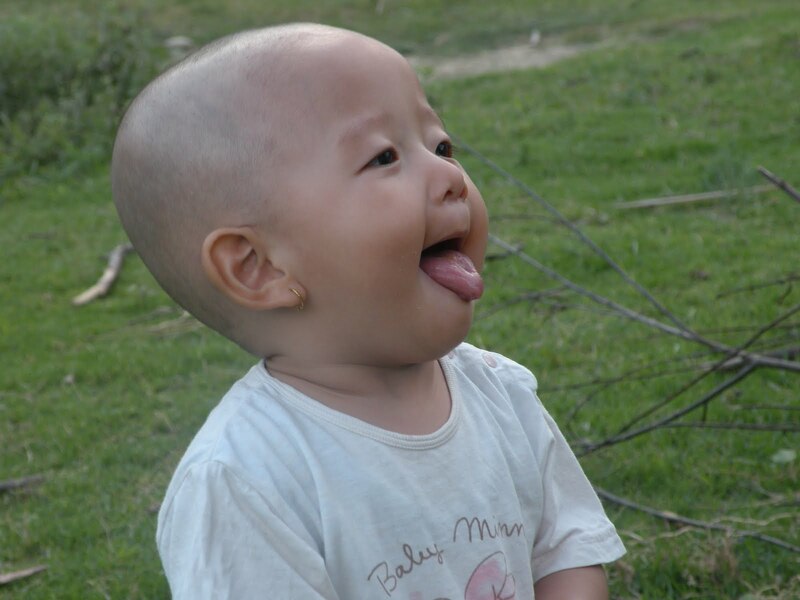 Last Sunday we saw a clean shaved toddler in Punakha that inspired us and we decided. Our girl was sleeping when we drove her to the saloon. I told the barber, I will do his job and pay him the price-fearing my daughter might not like him, but interestingly she never woke through out the process. As the machine ran through her hair I felt very sorry, and my wife nearly cried. She looked so pitiably adorable yet we felt bad for snatching her girlish looks. After it was all over she woke up- now she looked very naughty. The barber warned us not to let her look in the mirror for sometime, he told us of stories where babies scared themselves to sickness. If you tease her about her hair, this is what she does! We made her feel her new head with her hand and gradually took her to mirror. Alas, even a girl of her age feels the difference, she looked sad and ran away from the mirror- and yes, agreed to wear cap for the first time in 18 months. We often see her go to the mirror and return with hanging face. Now she asks for cap every time she wants to go out. Years from now, when she walks with her silky hair she would look in the mirror and love us for having shaved her once. For now, babe, we are sorry. But you look so so so Cute! This reminds me of my own incident with going bald. I dont know if its true, the thick hair.....mine was because it was curly. The story was that if you shave curly hair it will grow out straight (It DOESN'T!!) Its good that you did this when she was young, though. I was in class 8, shaved my hair in winter, went to school looking like a boy even in a kira. Can't imagine how that didn't scar me for life, haha. :)Your daughter is really cute. Hope it works! I have eight year old daughter and you will be surprised to know that she had only one hair cut (not major) this far. She still has thin hair but i can feel the accumulation of hair on her head with time. I am not sure if the growth of hair really accelerates after shaving, but I hope it works for your daughter. Good luck to you, your wife and sweet little daughter of yours. I am sorry shaving didn't do any difference to your hair, lol. Let's see what happens to my daughter's hair. Thanks for finding her cute! @Anu, Hope shave gives my daughter power, intelligence and long life. For sometime we were really sorry, but now we find her the cutest in newlooks! @Sangay, I heard it's scientifically proven, why don't you try shaving your daughter once, or are you going to wait and see how mine worked? Won't it be too late...lol by then your daughter won't agree to shave at all, younger the better. Oh, she is a boy. lol...Cute baby. @Di, you shouldn't be sorry, your hair is your signature. I like it actually. @Porky, lol she is a girl and a beautiful one, but for now, for the want of thick hair we have made her Kingkong. Hey! The story of your little girl is so like mine but I was in class II by then. I was not shaved by parents though. It was a mass hair cutting in the school. I even remember how I surprised Ama and family by removing the tego which was covered all the way from school to home. It was really a bitter experience to have it cut in bald and look like a boy.I believe that's why I really have a straight and thick hair at present. P.S. Your daughter is still a beautiful baby. Yeesi, looks like shaving is kind of a ritual that no one can escape- whatever the reasons are, thank god I have done it to my daughter at this time of her life. Are you sure you owe your good hair to that shaving? Then I am hopeful. Thanks for finding her beautiful- I am loving it!